We are just 334 days from the Iowa presidential caucuses! So far, twelve Democrats have announced their intention to run for the Democratic Party’s presidential nomination and we are still waiting for a few more candidates, including Vice President Joe Biden and former Texas congressman Beto O’Rourke, to join the race. Which of these candidates has generated the most buzz? For today’s post, let’s look at Wikipedia “pageviews” data for the 10 candidates who declared their candidacy before February 28, 2019. In the past, political scientists (i.e. Smith and Gustafson 2017; and Yasseri and Bright 2016) have looked at ways these “pageviews” can help investigators predict the outcome of elections. While it is too early to predict who will win the Democratic presidential nomination, it is never to early to see how different indicators can help us think about different political events. 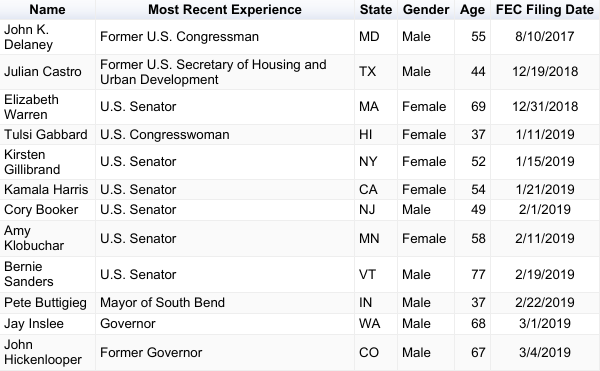 Wikipedia data suggests that these 10 candidates’ pages earned 4,633,621 “pageviews”. 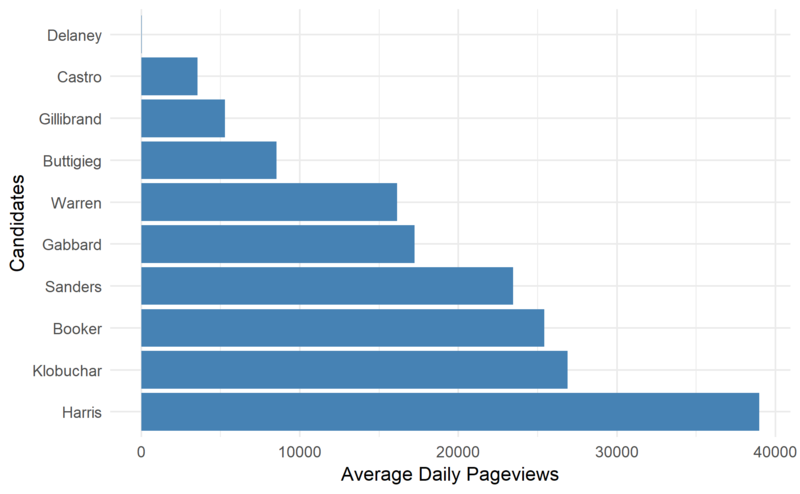 Among these candidates, Harris leads the field in terms of average daily “pageviews”. I am surprised that Klobuchar is in second place, edging both Booker and Sanders. I am even more shocked that Buttigieg’s presidential aspirations have generated more buzz than Gillibrand’s or Castro’s candidacies. This graph fails to take into consideration each candidate’s “pageviews” per day. For example, while Sanders may have the fourth highest average daily “pageviews”, he did not announce his second presidential run until February 19,2019 and since then many people have visited his Wikipedia page. 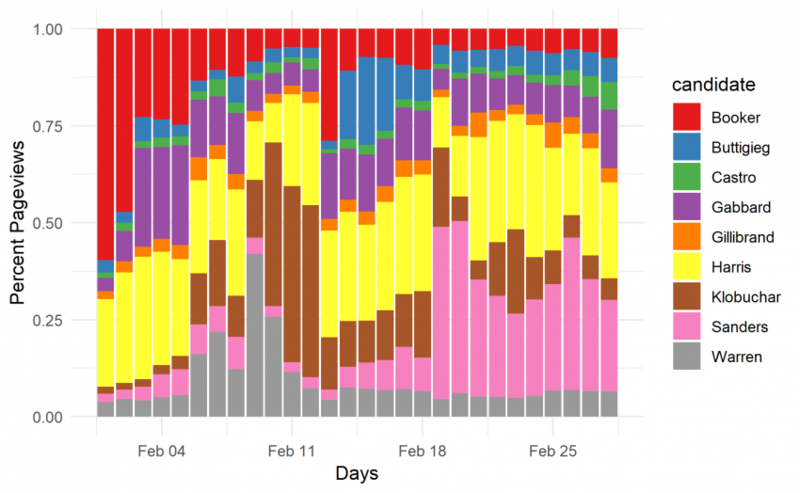 The following stacked barplot captures each candidates share of daily “pageviews” in relation to all candidates’ “pageviews” for February 2019. Given that Delaney’s daily “pageview” average is 28, I did it not include his data in this graph. This plot helps us visualize Wikipedia readers’ interests on each of the nine candidacies over time. It important to note that these “pageviews” are not indication of readers’ approval for a candidates’ campaign. After all, their Wikipedia pages include information that could turn-off potential supporters. But the plot demonstrates that many people are paying attention to the ever expanding group of Democratic contenders vying for their party’s presidential nomination. B. Smith and A. Gustafson. 2017. “Using Wikipedia to Predict Election Outcomes: Online Behavior as a Predictor of Voting,” Public Opinion Quarterly, 81(3): 714-735. T. Yasseri and J. Bright. 2016. “Wikipedia traffic data and electoral prediction: towards theoretically informed models,” EPJ Data Science, 5(22).